The latest Nissan Crossover and SUVs are built to take a lot, but the extreme driving conditions they may suffer from may not be what you expect. You may think that extreme driving only occurs when you take your Juke or Rogue up into the mountains or off the beaten path, but driving in and around Spokane can create some stressful driving. At Bob's Service Center, we check your brakes and fuel lines as part of our Nissan repair services because we know these are areas that can experience great stress. The simple stop and go commuting around Spokane can create extra wear on brake pads and you may need them replaced sooner than you expect. Even if you are driving the new Leaf, it is subject to the same stresses as a non-electric car. As more and more people switch to Hybrid fuel vehicles, it is good to know that you can still get them serviced at Bob's Service Center. 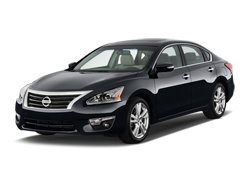 We provide the best quality Nissan service and repair to all their models. If you are driving a Hybrid Armada or Rogue, we can make sure that your fuel system is kept clean and in good repair. Our Nissan Service always emphasizes the condition of your tires and brakes because they are an important part of your fuel economy as well. Call today and set up an appointment for Nissan repair or service at Bob's Service Center. We are located right in Spokane and no matter what type or year Nissan you own, we have the experience to keep it running right for you.